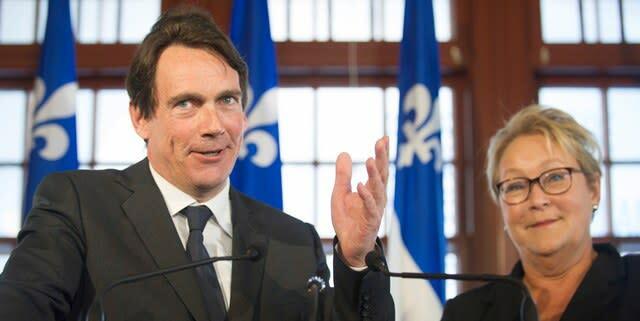 Can Pierre Karl Péladeau be the Lucien Bouchard of this era? We all remember Lucien Bouchard. He was, of course, the former Mulroney cabinet minister, turned founder and leader of the separatist Bloc Quebecois who was the inspirational leader of the 1995 referendum. Well, there are some suggesting that, the Parti Quebcois' latest star candidate is sort of a second political coming of Bouchard. On, Sunday, Pierre Karl Péladeau (PKP) — a 52-year-old billionaire media baron who was one the head of Quebecor — announced his candidacy for Pauline Marois' party. "My devotion to the Parti Québécois is a devotion that rises from my most intimate values — that is to say: To make Quebec a country," he said, according to the Toronto Star. The Globe and Mail's Konrad Yakabuski described the announcement as a "seismic shock" to both Quebec and Canadian politics. "Pierre Karl could be the Lucien Bouchard of the next Quebec referendum,” explained a leading Quebec federalist who worries that Mr. Péladeau’s high profile as a celebrity, and credibility as a successful businessman, would be more than a match for the deeply unpopular Mr. Harper on the campaign trail. In 1995, the charismatic Mr. Bouchard became the de facto leader of the Yes side, overshadowing then-PQ premier Jacques Parizeau and nearly pushing sovereigntists over the top in that year’s referendum. The linkages don't stop there. According to the Globe and Mail report, Péladeau was a protege of former prime minister Brian Mulroney — just like Lucien Bouchard. A York University scientist doesn't go as far as dubbing him the next Bouchard, but does says that the Péladeau 'acquisition' is significant for the PQ and their sovereignty movement. In an email exchange with Yahoo Canada News on Monday morning Bruce Hicks said that while he may have some warts, Péladeau's candidacy gives the PQ credibility on the economy issue and separatists an example to parade about. "[As] a successful billionaire businessmen who supports independence, his candidacy may convince voters ‎that secession won't be undertaken if there is great financial risk," Hicks, a Montreal native says. "On balance, in spite of what points his detractors might try to make about his business acumen and interests, the sheer celebrity of being heir to one of the two most successful Quebec francophone family fortunes (and husband to one of Quebec's biggest television personalities) his endorsement of the PQ and independence will sway an important group of voters. "Low information voters rely on information shortcuts (or heuristics) and one of the easiest cues is to look at who is supporting a political party or cause ‎and if you respect them or identify with them then follow their lead. It is low information voters who decide elections and, sadly, will decide the next referendum on the future of Quebec." In other words: expect to see a lot of PKP in this election and in the impending referendum ahead.